Nothing is more terrifying than the witch who wields red magic. Witches must choose the path they will follow, and Darlena Agara is no exception. She’s been putting it off long enough, and in her case, ignoring it has not made it go away. In a moment of frustration, Darlena chooses to follow Red Magic, figuring she had outsmarted the powers that be, since there’s no such thing as Red Magic. But alas, Darlena’s wrong (again) and she becomes a newly declared Red Witch. Her friends are shocked and her parents horrified by the choice Darlena has made. As a Red Witch, she now governs one third of the world’s chaos. She is the walking personification of pandemonium, turmoil, and bedlam, just as the patrons of Red Magic would have it to be. But Darlena believes there must be more to Red Magic than chaos and destruction, and she sets out on a journey to achieve balance. Only doing so puts her at odds with the dark goddess Hecate, who simply will not allow Darlena to quit. She encourages Darlena to embrace who and what she is and to leave good magic to the good witches. If only Darlena could, life would be simple, and she would not be the Daughter of Chaos. 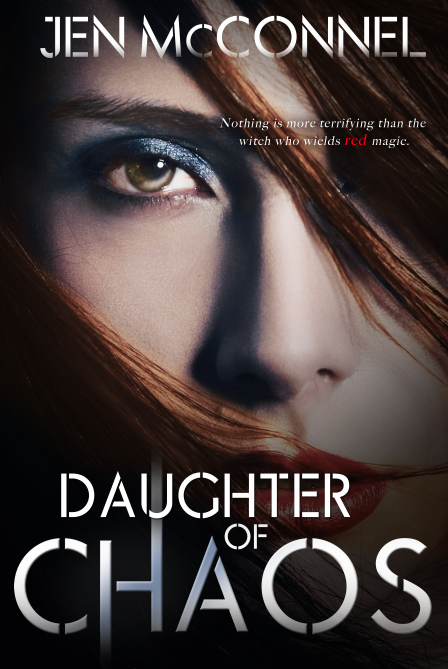 DAUGHTER OF CHAOS is the first in a YA paranormal trilogy. Coming March 2014 from Month9Books. Jen McConnel first began writing poetry as a child. Since then, her words have appeared in a variety of magazines and journals, including Sagewoman, PanGaia, and The Storyteller (where she won the people’s choice 3rd place award for her poem, “Luna”). She is also a former reviewer for Voices of Youth Advocates (VOYA), and proud member of SCBWI, NCWN, and SCWW. A Michigander by birth, she now lives and writes in the beautiful state of North Carolina. When she isn’t crafting worlds of fiction, she teaches writing composition at a community college. Once upon a time, she was a middle school teacher, a librarian, and a bookseller, but those are stories for another time. Add DAUGHTER OF CHAOS on Goodreads! Connect with her on Facebook. Reblogged this on MY BLOG13.